Technology allows us to make phone calls, dictate texts or emails and update social media while driving – all actions that are proven to increase crash risk. The National Safety Council observes April as Distracted Driving Awareness Month to draw attention to this epidemic. NSC wants to empower you to put safety first and Just Drive. Create awareness in your workplace, your home or your community by sharing the distracted driving message. Lead a safety meeting or toolbox talk with all employees on the topic of distracted driving. NSC offers infographics, a poster, a fact sheet and a number of social media-friendly graphics. When you share the Distracted Driving message on social media, be sure to use the hashtag #JustDrive on all your posts, shares, and retweets. You can pledge to your children, to your loved ones, to your co-workers and to yourself that you will be an attentive driver. Share the pledge on social media if you’d like. Encourage your family members, your co-workers and your employees to take the pledge also. click here to take the focused driver challenge - pledge today! Stay on top of the distracted driving issue all year long by signing up for the Focus on the Drive e-Newsletter. If knowledge is power, then Focus on the Drive, a quarterly newsletter from the National Safety Council, can put you, your family, your employees, and your business in the driver’s seat. Whether you’re looking to protect your workers, convince someone else of the dangers, keep your family safe, or just make a difference, this is the best way to stay connected. It’s also a great way to be reminded to schedule a quarterly safety meeting on the topic of distracted driving. 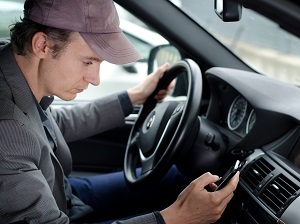 Employers have realized the dangers of cell phone use while driving and are taking action by passing policies to prevent cell phone distracted driving. The National Safety Council recommends policies that prohibit both hands-free and handheld devices and apply to all employees. Learn the facts by downloading The Free Cell Phone Policy Kit. This kit helps employers reduce crash risk and has all the materials you need to build leadership support in your organization for a cell phone policy and communicate to employees the crash risks and need for a policy. The NSC offers many more resources that you can utilize for your company to promote Distracted Driving Awareness. Visit nsc.org to find videos, articles, statistics, facts, online courses and many other ways you and your company can engage in the important message of Distracted Driving Awareness Month. Weeklysafety.com gives you and your company access to hundreds of safety meeting topics and toolbox talks, safety resources you won't find anywhere else, safety topics professionally translated into Spanish, and so much more. This includes safety topics on Defensive Driving, Driving on Site, Work Zone Safety, and Operating Heavy Equipment in both English & Spanish. Several versions are made available including 6-page Manager’s Presentations, 2-page Foreman’s Topics and 1-page Fast Toolbox Talks. We believe that access to a proven safety meeting program shouldn’t cost companies thousands of dollars. Companies shouldn’t have to make a decision between safety training and making payroll. With our low monthly subscription, every company (no matter how many employees!) gets everything we have to offer, without the expensive bill. Use as many safety topics as you need, as often as you want! Start right now and get a full suite of safety meeting topics, toolbox talks, and safety resources to expand, upgrade, or jump-start your safety training program. Click the button below to find out more! Yes! I want to access hundreds of safety meeting topics today!